Polycystic Ovarian Syndrome (PCOS) – It’s Not Just about the Ovaries! 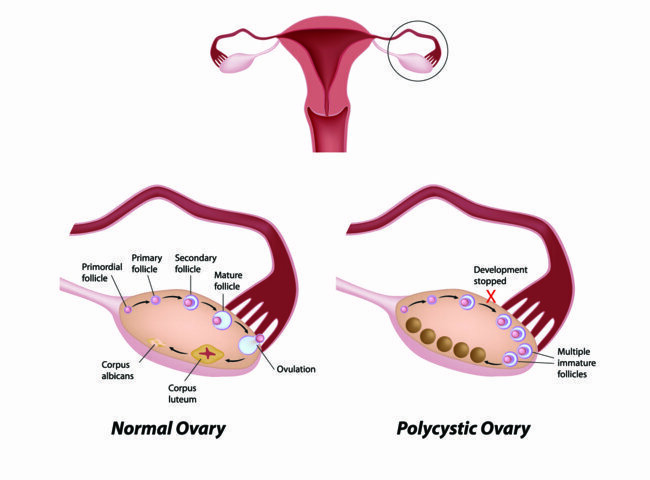 Polycystic ovarian syndrome (PCOS) is the most common endocrine disorder of reproductive-aged women. Women will usually present for irregularity of their menstrual cycles, excessive hair growth, acne, or infertility. Each of these symptoms should be taken very seriously as they are often a sign of an underlying hormonal imbalance. Stein and Leventhal first described the polycystic ovarian symptom complex in 1935 and since that time the diagnostic criteria has evolved to the now current Rotterdam criteria of 2003. 3) Polycystic ovaries on sonography. In addition, you must also exclude other causes for the findings. Once the diagnosis has been established then treatment should focus on the presenting complaint. If the patient would like to become pregnant then ovulation-inducing medications are used. If cycle regulation or reduction in hyper androgenic symptoms is desired then hormonal medications are used to treat these conditions. A reproductive endocrinologist has had specialized training in the diagnosis and management of the conditions associated with PCOS. Infertility is defined as the inability to become pregnant after one year of trying. Approximately 85% of couples will be pregnant after one year. The remaining 15% are considered to be infertile. Not all couples though, need to attempt pregnancy for one year before seeking care. This includes women over the age of 35 and women who don’t have regular menstrual cycles. Other special circumstances include women who have had a tubal ligation or men who have had a vasectomy. When a patient meets the above criteria for “infertility”, a basic infertility evaluation should be undertaken. This includes assessment of ovulation, confirming the presence and concentration of sperm, and documenting tubal patency. By evaluating these three areas you will be able to identify the cause(s) of infertility in most cases. Once you have identified the cause of infertility you will be able to determine whether you are comfortable treating their disorder or if your patient should be referred to an infertility specialist.